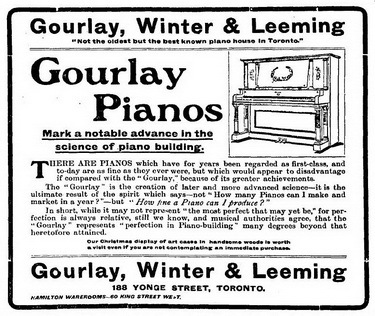 Gourlay, Winter & Leeming: "Canada's Most Nearly Perfect Instruments"
Gourlay, Winter & Leeming, 188 Yonge Street, Toronto, 1890-1922, manufacturer of pianos and phonographs. Photo-postcard, postmarked Aug. 18, 1907. 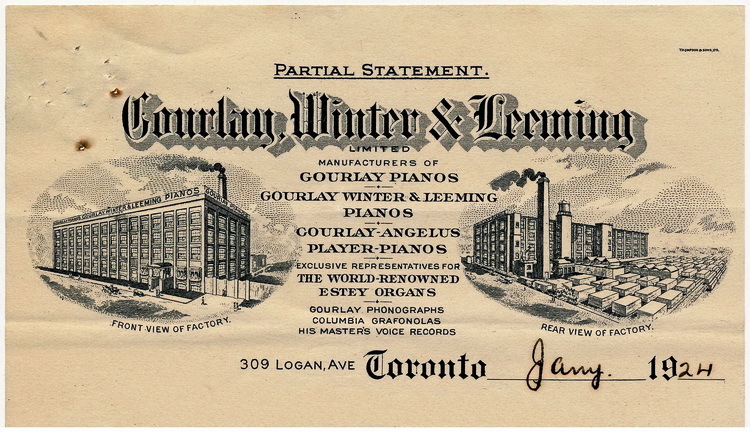 The firm of Gourlay, Winter & Leeming (GWL) was a late arrival in a small field of distinguished manufacturers and dealers of pianos and organs located in Ontario, Canada, in the second half of the 19th century. As with many of its competitors, when the sale of these instruments declined with the increasing popularity of the talking machine, the company turned its hand to the manufacture of a phonograph. (Although a "phonograph" is properly specific to Edison's cylinder player, by the early 20th century this term was being used indiscriminately to describe either a cylinder- or a disc-playing machine and it is used in this article to document the so-named disc-playing Gourlay Phonograph). "Three men, experienced in the same line of business - that of the manufacture, purchase and sale of pianos and organs - formed a partnership, rented a commodious and conveniently-situated building, stocked it with the instruments of several standard makers, put up an attractive sign, polished the large plate-glass windows, and then threw open their doors to the public". This auspicious event took place in October, 1890, in a four-storey building located at 188 Yonge Street in Toronto, west side, a few doors north of Queen Street. The first-named and senior member of the firm, Robert S. Gourlay (1852-1932), was formerly, before the age of 30, the successful general manager of the Mason & Risch Piano Company in Toronto. His partners, Francis William Winter (1856-1930) and Thomas Leeming (1859-1956), had, for many years, been fellow workers in different departments of the same business. All three gentlemen brought to the new company a thorough knowledge of the essential features of the piano trade. In 1892, GWL purchased a large stock of upright pianos from the American firms, Weber Piano Company and Sohmer & Co., (New York) and added organs from the Ontario firm, W. Doherty & Company (Clinton). The company built up a large trade and achieved immediate success due, in part, to the musical merit of the high-class instruments that it sold. It claimed that it was not identified with any special factory and, by consolidating and centralizing the output of eight or nine manufacturers, it was able to provide substantial savings to the customer. From the earliest days, its literature advertised a full service of its product: "sold, rented, exchanged, moved, stored, packed, tuned, repaired, repolished". On Sunday morning, March 3, 1895, the intersection of Yonge and Queen Streets was the centre of a great conflagration, the damage reaching nearly one million dollars. Robert B. Simpson's magnificent, new seven-storey department store on the south-west corner was burned to the ground, his stock a total loss. The smoke that was given off by the fire did considerable damage to the Gourlay, Winter & Leeming warerooms located five buildings to the north, across Queen Street. The next week, the company offered all of its instruments, "on display just as they escaped from the fire", at greatly reduced prices (G, Mar. 11, 1895). "Always examine our stock before purchasing, and though we may not sell to every caller, we do sell to most, and always win their admiration for the artistic and refined excellence of our pianos". 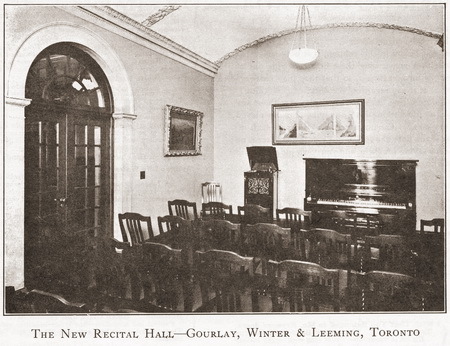 As early as 1892, The Globe reported numerous musical recitals and concerts sponsored by Gourlay, Winter & Leeming, held in Massey Hall, Conservatory Music Hall, Association Hall, Temple of Fame Auditorium and other venues with ticket sales handled from the Yonge Street store. By early 1900, a very popular event in Toronto was the "soirée musicale" which was organized by the company and held monthly in the King Edward Hotel. In February, 1897, Martinus Sieveking, the great Dutch pianist (Paderewski's rival), "the Mephisto of the piano", took Toronto's musicians by storm. He visited the company's warerooms and, while there, played on the Gerhard Heintzman grand. He was greatly pleased with the instrument and "agreeably surprised to find such artistic pianos made in Canada". A magnificent Gerhard Heintzman upright was selected and sent to the Queen's Hotel for the great pianist's private use while in Toronto (G, Feb. 23, 1897). 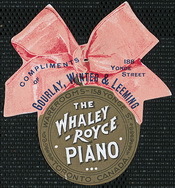 In March, 1897, GWL became the exclusive city and central Ontario agent for the Canadian-manufactured Whaley-Royce piano whose company's warerooms were located just down the street at 158 Yonge Street. In 1899, GWL was appointed sole agent for Western Canada of the world-renowned Estey organ, the Stella and Regina music boxes, the Virgil practice clavier and, "for evangelistic purposes", the Bilhorn telescope organ (G, Apr. 1, 1899). Its annual exhibit at the Canadian Industrial Exhibition in Toronto occupied about one quarter of the Music Hall, prompting one visitor to remark: "With increased capital [the firm] might own the building" (G, Sep. 6, 1897). "We Sell Pianos By Mail. Of course, we do not mean 'pianos SHIPPED by mail', but 'pianos ORDERED by mail'. We do an ever-increasing business in this manner" (G, Apr. 14, 1900). 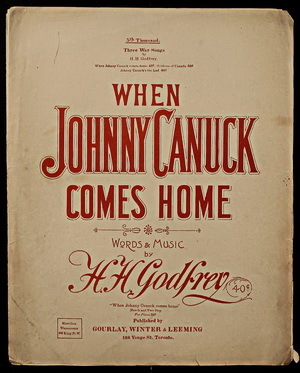 Sheet Music, "When Johnny Canuck Comes Home"
That year, Leeming moved to Hamilton, Ontario, to open a branch wareroom located at 66 King Street West, and stayed there for 10 years. Also in 1900, GWL entered the field of music publishing, notably with the very popular song "When Johnny Canuck Comes Home", words & music by Henry Herbert Godfrey (1858-1908), who was working as a manager at the firm. The character, Johnny Canuck, made its first appearance in political cartoons in 1869 as a personification of the wholesome, simple-minded Canadian. He was often portrayed resisting the bullying of the United States' Uncle Sam. The first production of the song was in Massey Hall on Easter Monday, April 16, 1900 (G, May 28, 1900). In September, the company ran a song competition for school children offering a $20 prize, in gold, for a new song of three verses and chorus (words only) which could be sung to the tune of "When Johnny Canuck Comes Home". The subject was to be the deeds of the Canadians in the South African, or Boer, War (1899-1902), Canada's first official overseas war (G, Sep. 22, 1900). 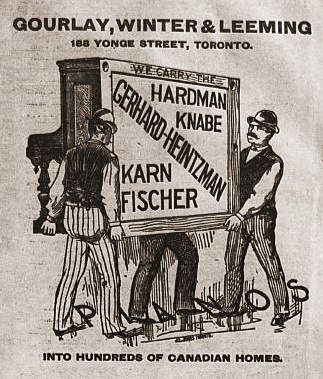 In 1901, GWL was handling the following instruments: Knabe pianos, Gerhard Heintzman pianos, Karn pianos, Hardman pianos, Mendelssohn pianos (Toronto), Dominion pianos (Oshawa), Craig pianos (Montreal), Estey organs, Mason & Hamlin organs, Karn organs, Dominion organs, Thomas organs (Woodstock), Bilhorn organs (Chicago) (G, May 8, 1901). In January, 1902, the firm announced that "our business for the past year has been the largest in our history" (G, Jan. 8, 1902). It reported steadily-increasing sales to Western Canada, specifically Manitoba, the Territories and British Columbia (G, Apr. 14, 1900). "upright grand, overstrung tri-chord scale, three pedals, including muffler, improved double-repeating action with brass regulating screws, patent noiseless pedal action, heavily flanged iron frame, finest ivory and ebony keys, case in dark mahogany with full length, automatic swinging panel and Boston double fall-board" (G, Apr. 10, 1903). In May, the company announced that it was equipping a new piano factory and, in view of the large expenditure, offered to buyers its entire stock of pianos "at your own price!" (G, May 25, 1903). 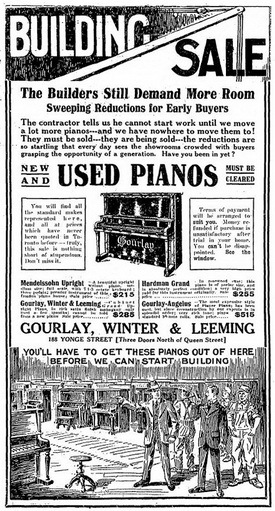 Finally, on December 17, 1903, in time for Christmas sales, the first advertisement appeared in The Globe newspaper for the "Gourlay Piano", manufactured in its new factory under the supervision of piano builder, John E. Hoare, who joined the firm as manufacturing partner. The main factory was located at 261 King Street West, near John Street, supplemented by additional factories at 110 Adelaide Street West and 45 Queen Street East, as well as numerous storage buildings scattered around the city. "We agree to accept the return of any instrument in exchange for a new Gourlay piano, said Gourlay piano to be supplied at the then current net cash price, and the instrument so exchanged to be taken back at the full price paid, less just $10 per year for wear and depreciation" (G, Mar. 23, 1905). Some things really were better back then! "The Gourlay piano was deemed exactly suited to the severe climatic conditions of Japan owing to the solidity of its construction and its musical reliability, and the selection is justified by the fact that the instrument, after two months of travelling on sea and on land, arrived at its destination in perfect tune. This is a record that is very seldom equalled by other pianos of Canadian or foreign manufacture, and seems to justify the firm of Gourlay, Winter & Leeming in the adoption of the motto, 'Made in Canada for the World'" (G, Feb. 2, 1905). "Gourlay Pianos Are Not Merely First-class, They Are Something BETTER". "Some four months have elapsed since we received the Gourlay piano which was shipped last July. After three months' traveling and some very rough handling in this country, the piano was found to be in perfect order. The instrument has now stood the test of a very hot summer which has had no effect upon it in any way whatsoever". 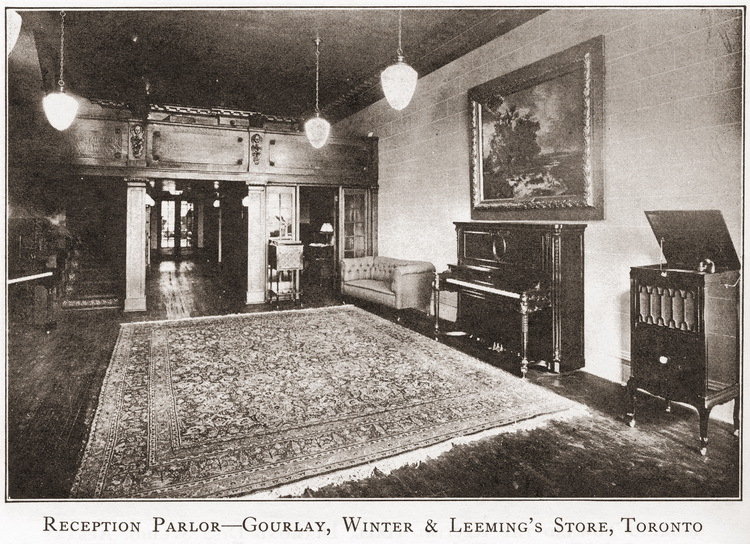 "Already the T. Eaton Company are at work on an immense branch store [in Winnipeg], and it is now announced that the firm of Gourlay, Winter & Leeming will be the next to invade the west. They have secured premises on Donald Street, directly opposite the new Eaton block, where they will establish warerooms and salons especially designed for the comfort and convenience of those desirous to hear the dulcet tones of the Gourlay piano.... A good reputation travels afar, and therefore the people of Winnipeg will not require enlightenment as to the history and success of Messrs. Gourlay, Winter & Leeming" (G, Apr. 24, 1905). The Winnipeg branch was included in the company's advertising for the first time in December (G, Dec. 9, 1905). 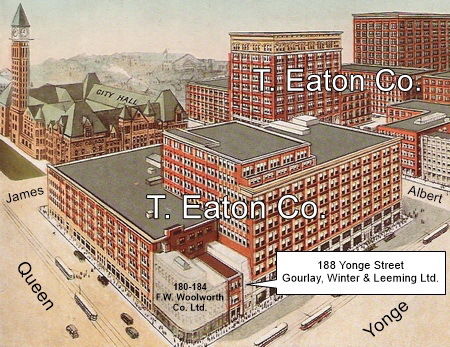 As you will read later in this article, the T. Eaton Company was to have a huge impact on the fortunes of the Toronto building at 188 Yonge Street. "A young professional man moved from Canada to reside in Elmira, New York. There he fell in love with a charming young lady who, by the way, had an idea that nothing good, save the young man in question, could come out of Canada. The wedding day was fixed and the bridegroom decided to prove the progress of his country by giving the bride a wedding gift manufactured in Toronto, telling her in the meantime that nothing better was manufactured in the United States. Naturally she was dubious, until the present arrived. It was a Gourlay piano, an instrument so elegant in tone and so beautiful in finish that the young lady was more than delighted with it. The American protective duty on pianos is very high, but it is no higher than the opinion the bride now has of this country, due entirely to the practical patriotism of the young Canadian abroad" (G, Mar. 26, 1906). "Gourlay Pianos - Canada's Most Nearly Perfect Instruments" (G, May 22, 1905). "The Gourlay Piano, when compared with other Canadian Pianos, is as the Kohinoor among diamonds - IN A CLASS BY ITSELF" (Tyrell's Society Blue Book, Toronto edition, 1906). "The growth of our business is again indicated by the opening of another department, further announcement of which will shortly be made. Just now our chief interest is to provide the necessary wareroom space". No further announcement of the new department appeared in print. 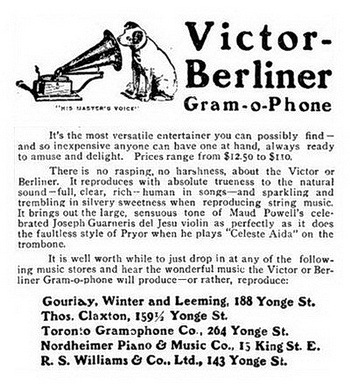 However, the mystery was solved by several Berliner ads that appeared in The Toronto Daily Star (TDS) newspaper in late November and early December listing Gourlay, Winter & Leeming as one of the companies in Toronto now selling Victor records and Victor or Berliner Gram-o-phones! The company itself did not promote Victor products in its advertising nor did it even mention the store's talking machine department in its ads for another ten years. Gourlay, Winter & Leeming continued to expand. On July 30, 1906, the company concluded the purchase of a large block of land, about 25 acres in extent, on Logan Avenue, between Queen and Dundas Streets, near Carlaw Avenue, the site for the building of a new piano factory. It also concluded negotiations with the Grand Trunk Railway Co. to put a switch through the property, something that had long been needed in order to make the area suitable for factory sites (G, Jul. 31, 1906). A March 4, 1907, advertisement in The Globe mentioned, for the first time, a second branch wareroom located at 195 Dundas Street in London, Ontario. Also that year, GWL absorbed the Kingston, Ontario piano firm of R. McMillan & Co. In 1907, the company began offering a self-playing mechanism for its line of pianos. Invented the year before by Wilcox & White Co. (1877-1921), in Meriden, Connecticut, and called the "Angelus", the mechanism was an external cabinet with felt-covered "fingers" that, when pushed up to a piano keyboard, turned any ordinary piano into a mechanical piano. 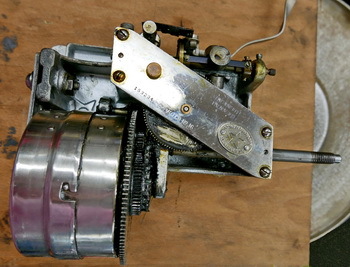 It used a perforated roll and was operated by foot pedals. Initially, GWL advertised the "push-up player" version of the Angelus. 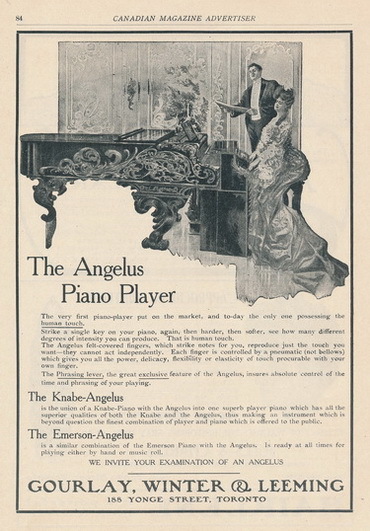 Simultaneously, the device was available as an internal modification on some pianos and the company advertised the "Knabe-Angelus" and the "Emerson-Angelus". 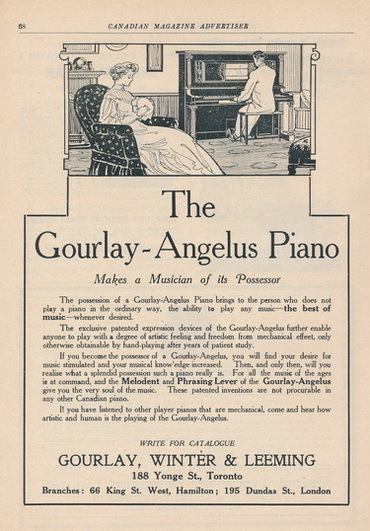 In 1908, the device was installed within the Gourlay piano and marketed as the "Gourlay-Angelus Piano" with "the Phrasing Lever, the Melodant, the Melody Buttons and the Diaphragm Pneumatics" (G, Dec. 17, 1908). "The remarkable, new 'Artistyle' Music-Rolls make it possible to render, at first sight, any music with all those delicate shadings of time and tone that go to make truly artistic playing" (G, Apr. 10, 1909). Through 1909 and 1910, the company ran numerous one-time, original ads in The Globe and Toronto Daily Star newspapers, often three times a week, selling new and used pianos. It revived its piano club and now offered 50 new Mendelssohn pianos at a greatly reduced price under exactly the same terms as its 1904 club. The Mendelssohn Piano Club was promoted aggressively in numerous large display ads through 1911. 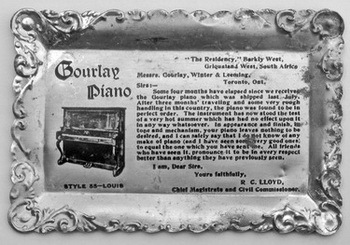 The new Toronto factory located at 309-353 Logan Avenue was in operation by mid-1910 to meet the increasing production demand for Gourlay pianos which now topped 1,400 a year. In 1911, new branch agencies were opened in St. John, New Brunswick (168 Union Street) and Calgary, Alberta (220 Twelfth Avenue West). The London, Ontario wareroom was relocated to a more favourable building at 261 Dundas Street. The year 1915 brought major organizational changes to Gourlay, Winter & Leeming. The company was incorporated with Robert S. Gourlay as president. Winter retired and Gourlay's son, David, was promoted from salesman to sales manager to vice-president. His second son, Albert, entered the business as manufacturing supervisor. Retaining the names of all of the original partners, the company was now listed as Gourlay, Winter & Leeming Limited, Importers and Manufacturers of Pianos, and Dealers in Pianos, Piano Players, and Organs. 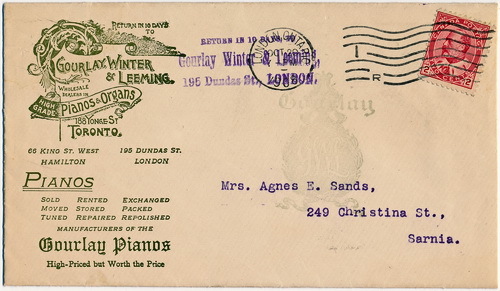 "In order that the closing of their retail store may not inconvenience prospective purchasers of pianos during the alterations to their store at 188 Yonge Street, Gourlay, Winter & Leeming have arranged to motor customers to the wholesale showrooms at the factory, 309 Logan Avenue. A full line of new and used pianos is shown, and, best of all, the customer has the advantage of factory prices. Whether or not a purchase is made, customers are motored home again without any obligation". How civilized! A week later, The Globe reported that many customers had taken advantage of the free auto service from home to the factory showrooms (G, Jul. 27, 1915). Toronto music-lovers and admirers of handsome architecture will have a delightful surprise to-morrow when Gourlay, Winter & Leeming reopen their store at 188 Yonge Street. Those familiar with the home of Canada's finest pianos will hardly recognize it in its handsome new dress of white and black and gold. A striking feature of the storefront is the invisible window - the only one of its kind in this country. But it is on the interior of the four-storey building that the architect has lavished his skill and care. The new piano showrooms, mezzanine floor and phonograph showrooms will compare favourably with the most artistic private homes, while the large recital hall, in brown and white, is a fine example of what can be done when the comfort of patrons and the proper acoustic requirements are the main objects. "Until a short time ago we were not interested in selling phonographs, preferring to wait until the inventors and manufacturers would produce that type of an instrument that was in keeping with the aims and traditions of this house". "We wish you to see our new showrooms - seven of which are devoted to the demonstration of Edison Diamond Disc Phonographs, and Columbia Grafonolas and records for Edison, Columbia, and Victor machines". The main showroom is finished in oak and gold. Here customers will be able to view at their leisure the standard models of the famous Gourlay pianos and Gourlay-Angelus player-pianos. Opening off the main showrooms are the rooms for the demonstration of phonographs, while at the rear of the main floor is the beautiful recital hall, where free musicales will be given from time to time. On the second and third floors are a number of fine showrooms, where customers will be able to make a more detailed inspection of the large number of different Gourlay styles carried at the store. Three showrooms all show different treatments of decoration, the blue room on the second floor and the brown room on the third floor being especially worth seeing. The fourth floor is given over to organs and used pianos. In the basement are sound-proof rooms for the demonstration of phonograph records and player-piano rolls. To-morrow morning the first of the invitation musicales will be held. The feature of the first entertainment will be the singing of Mr. Hartwell Demille. Visitors will also have the pleasure of hearing the new electric Gourlay-Angelus Artrio - the latest triumph of the Angelus factory. The records which will be played were made by Harold Bauer and Ethel Leginska, and give their own interpretation of the best work of famous composers. The Edison Diamond-point Phonograph, which is noted for its purity of tone, will also be played. At the afternoon musicale, Mr. Frank Oldfield will sing" (G, Aug. 31, 1915). Model A-100 between the two doorways, back centre. Gourlay upright pianos, right and left. The November 1915 issue of Edison's trade publication, Edison Phonograph Monthly, featured an article titled "Toronto Shows How To Reach The Elite With Three Edison Recitals A Day" which heaped praise on Gourlay, Winter & Leeming's reconstructed warerooms. The article also mentioned that "local instrumentalists were employed for the purpose of making tone-tests of Mr. Edison's new instrument". Tone-tests were live recitals meant to demonstrate the superior quality of Edison Diamond Disc recordings and machines. Artists played in partnership with Diamond Disc recordings of themselves. From time to time, the lights would be darkened and the audience challenged to guess whether what they were hearing was live or recorded. The piano is a Gourlay-Angelus Artrio. The August 31 Globe newspaper announcement is the first time we are made aware that the company is selling Edison products. The next day's newspaper reported on the great success of the opening-day musicale, noting that several songs had been played on the "famous Edison Diamond Disc Phonograph". Two days later, on September 3, a notice of a free musicale that evening in the new recital hall, informs us that GWL is also carrying Columbia products: "The marvelous new electric Gourlay-Angelus Artrio, the Grafonola and local vocalists will provide the program" (G, Sep. 3, 1915). The company's listing in the City Directories was updated to reflect the new direction: Importers and Manufacturers of Pianos, and Dealers in Pianos, Piano Players, Organs and Phonographs. For the next three years, company advertising gave equal weight to the Edison Phonograph, the Columbia Grafonola, the Gourlay piano, the Gourlay-Angelus player-piano and, especially in the summer, to other makes of piano and used pianos. Its ads never mentioned the Victor Gramophone, only Victor records, so its 1906 venture into selling these machines ended sometime before 1915. By that year, GWL was dealing exclusively in new Edison and Columbia talking machines. It promoted its store as "The House of Good Service" (G, Mar. 18, 1916) and "The Most Select Grafonola Store in Toronto" (G, Dec. 9, 1916). 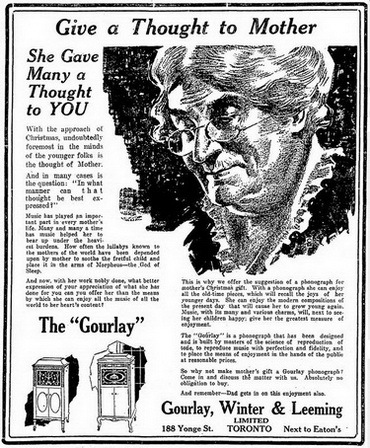 By 1919, GWL ads for talking machines appeared less and less frequently. The focus was almost exclusively on phonograph records, especially Victor records. The company rarely repeated its ads, but from April 1920 through October 1921, it ran the same ad every couple of weeks: "Select Your Victor Records at The House of Service". Ad repeated regularly in 1920 and 1921. "The Gourlay Phonograph is acoustically and mechanically perfect because it is designed and constructed by men who have made a life-long study of the production of tone and it is equipped with the finest reproducing, amplifying and operating equipment procurable". A follow-up ad, which appeared in The Globe on December 7 and The Toronto Daily Star on December 8, depicted a second, unnamed floor-standing model. "We Have Declared War Upon The High Cost of Doing Business which every buyer of a piano, piano player or a phonograph has had to pay and is still paying when he or she buys an instrument from a central wareroom or from one of the many branch warerooms whose operating expense is part of the selling cost of such instrument. Is there any reason why we cannot sell you an instrument from the factory rather than from a Yonge Street Store? We have closed all stores, including 188 Yonge Street, where we have done business for over 32 years, and are adjusting prices, eliminating all store costs. Remember the address, 309 Logan Avenue - Phones, Gerrard 619 and Gerrard 176 - phone and a car is at your service" (TDS, Dec. 1, 1922). "The New Policy - Factory to Home Direct (No Stops on the Way) Has Scored Success Beyond All Anticipation. Pay us a visit - remember you are under no obligation to buy from us, even if you let us send a car to bring you to and from the factory. 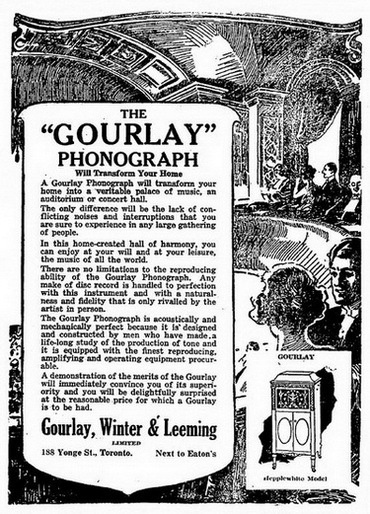 Extraordinary bargains are being offered in Phonographs exchanged for the pure-toned vibrant Gourlay instruments" (G, Dec. 15, 1922). One year later, on December 1, 1923, in a large Globe display ad, GWL announced that it was abandoning the phonograph business. 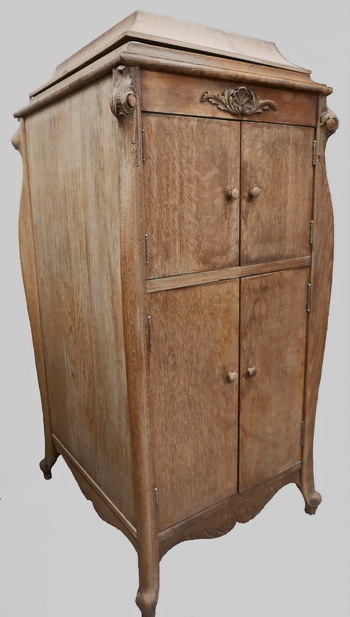 The Gourlay phonograph had been manufactured for two and a half years, from mid-1921 to late 1923. Few examples are encountered by collectors today. All of the models appear to be cabinet-style, floor-standing machines. It is not known whether table or console-style machines were manufactured. The earliest newspaper ads depict two straight-lined models, one named "Hepplewhite", the other unnamed, with elaborately-carved wood grilles covering the horn opening. The "Closing Out" sale ad from December 1, 1923, lists three models: one inexpensive and one mid-range model in mahogany or oak, and a high-end "Art style" model in mahogany and gilt. The original prices were $80, $175 and $325, respectively. 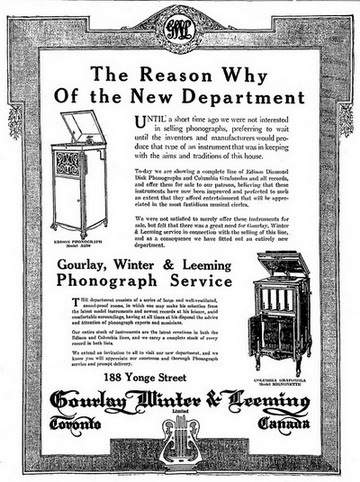 The Gourlay phonograph illustrated in this ad shows carving on the four corners of the cabinet, similar to contemporary Victor-Victrolas, two wood doors covering the horn opening replacing the wood grille used in the earlier models and an atypical pull-out file drawer for record storage. of PIANOS, PLAYER PIANOS and PHONOGRAPHS, hence the extraordinary values we are now offering". 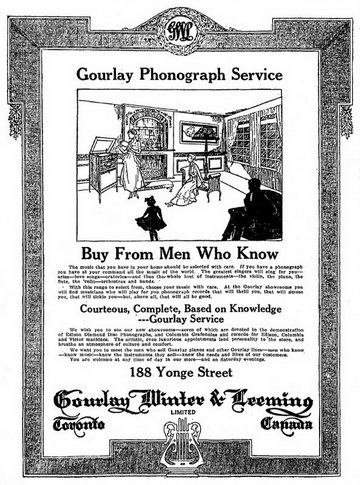 A sale ad from August 26, 1924 describes four Gourlay phonographs: two mid-range models in walnut or mahogany, a more elaborate model in oak and a top-of-the-line model with Queen Anne-style case. The original prices were $190, $200, $250 and $300, respectively. The latter two machines came with the "Flexi-file cabinet", no doubt the name for the record storage drawer depicted in the December ad. All of the Gourlay models were capable of playing all types of records, lateral- or vertical-cut, and all had attractive and distinguishing wood horns. 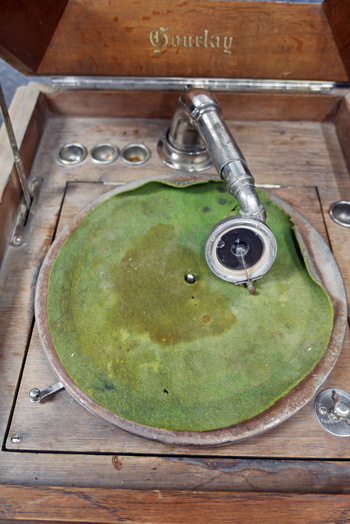 A Gourlay phonograph, currently under restoration by collector Doug McKen, was found in an antiques store in a small town in Saskatchewan. This model is identical to the one depicted in the December 1923 Globe advertisement. Photographs of the mechanics show that the company purchased its parts from the General Phonograph Corporation, supplier of Heineman and Meisselbach phonograph motors, tone arms and sound boxes, with a factory in Kitchener, Ontario and an agency in Toronto. Gourlay phonograph, ca 1923, with Heineman No. 11 tone arm and soundbox, and Meisselbach No. 16 double-spring motor. The soundbox swivels on the tonearm to play both lateral- and vertical-cut records. 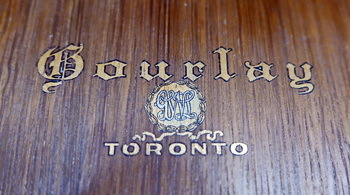 "Gourlay" labels on the lid and on the wood horn. 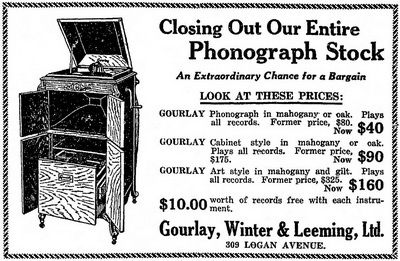 "Columbia, Edison and Gourlay phonographs, at less than half original prices, as we are closing out all phonograph business, easy payments, phone or call Gourlay, Winter & Leeming, Limited, 309 Logan Avenue, open Saturday afternoons" (TDS, Mar. 21, 1924). A cringeworthy ad for a used "Victor phonograph!" "HERE IS YOUR CHANCE to secure one of the finest Player-Pianos ever manufactured at a price never before equalled. Stock must be sold to close out the Estate of Gourlay, Winter & Leeming, Limited, and under winding-up proceedings the balance of stock is being sacrificed regardless of cost. Please bear in mind that the Gourlay instruments are the highest quality that skill and money could produce" (G, Sep. 2, 1926). In late 1924, the factory buildings on Logan Avenue were acquired by Adams Furniture Company Ltd. for use as a storage warehouse. City Directories for 1925 list Adams at 311-353 Logan and Gourlay, Winter & Leeming at 309 Logan. GWL continued to sell its products from this location for several years - "open by appointment, evenings and Saturday afternoons". Francis W. Winter, who had retired from the company in 1915, passed away at his winter home in St. Petersburgh, Florida, on February 24, 1930 in his seventy-fourth year. Robert Sloane Gourlay retired from GWL in 1923 and died in Toronto on November 29, 1932 in his eighty-first year. Thomas Leeming outlived his partners, dying in Toronto at age 97 on December 23, 1956. His obituary mentions that "at the time of his retirement in 1929 [he] was still actively connected with the piano manufacturing firm of Gourlay, Winter & Leeming" (G, Dec. 24, 1956). The year 1929 corresponds with the last listing in the City of Toronto Directories for the company at 309 Logan Avenue. 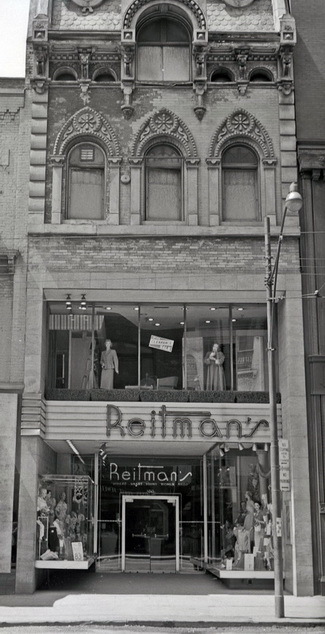 The showroom building at 188 Yonge Street, home of Gourlay, Winter & Leeming from 1890 to 1922, had few tenants, and fewer owners, over 100 years, but its history is memorable with an unfortunate final chapter. Its story is best told in concert with the surrounding buildings, beginning to the south at the northwest corner of Yonge and Queen Streets, addresses 180, 182, 184 and 186 Yonge, and to the north, 190 Yonge and above. City of Toronto assessment rolls for St. John's Ward list the area immediately to the north of Queen Street, on the west side of Yonge Street, as vacant land in 1861. There is, however, already a listing for 190 Yonge Street. That building had been occupied since the late-1850s by Robert Merryfield, boots and shoes. Temporary, two-storey structures occupied the vacant land in 1862 and 1863, described in city directories as Agricultural Society Buildings, operated by James Fleming, seedsman. One of the shopkeepers was William Bilton, importer of foreign and domestic fruits, oysters, fish and game. Street addresses for these temporary buildings appear in the 1864 City of Toronto Business Directory - Fleming is at 180, Bilton at 182, and Don C. Yale, marble cutter, at 188. 184 and 186 Yonge Street are listed as vacant lots in the assessment rolls for 1864, 1865 and 1866, although city directories list various wholesale grocers and a photographer, Thomas Gobert, operating businesses out of these addresses. "Bilton, during the next month, intends clearing out his large Stock of SEALED FRUITS ... as he intends giving up the Fancy Goods Business, and doing only an ostensible Oyster, Fish, and Game trade. Bilton's, Agricultural Hall, 188 Yonge Street" (G, Dec. 20, 1865). S. H. Knox & Co., toys, occupies the corner building, 180 Yonge, as well as the two buildings to the north, 182 and 184.
indicated at the top by PIANOS [ORG]ANS 88, is at 188 Yonge. The temporary structures gave way to permanent, three- and four-storey buildings. The 1866 and 1867 assessment roles list James Fleming as the owner of 188 Yonge Street and William Bilton as the occupant. In 1868, ownership changes hands to Charles McIntosh, who also owns 190 Yonge Street, while William Bilton is still shown as the building's occupant through 1870. In 1871, Bilton's wife, Alice Bilton, is listed as the occupant. The following year she is also listed as the building's owner. 188 Yonge Street remained in the hands of the Bilton family until 1912. They operated "an oyster, fish and game depot" on the site until 1890 when their daughter, then owner, Miss Naomi Bilton, leased the building to Gourlay, Winter & Leeming for use as a piano wareroom. 188 Yonge Street is surrounded on three sides by T. Eaton Co.
Robert Merryfield, shoemaker, continued to operate out of 190 Yonge Street until August, 1883, when T. Eaton Co., dry goods, moved into the row of buildings from 190 to 196 Yonge. Later directories extend Eaton's holdings: 190-200 in 1891, 190-208 in 1899, 190-214 in 1906, and finally, 190-218 in 1908. 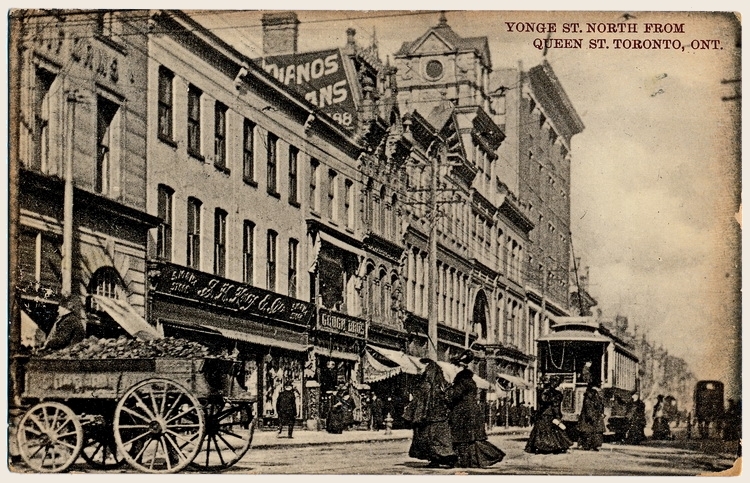 This encompassed all of the Yonge Street frontage north to Albert Street. In early 1906, T. Eaton Co., now described as a department store, purchased buildings on Queen Street, east of James Street, owned by the Wm. Davies Company and the Adams Furniture Company, which gave it possession of the entire block bounded by Queen, Yonge, Albert and James Streets, with the exception of the stores at 180, 182, 184, 186 and 188. The Gourlay, Winter & Leeming wareroom was surrounded on two sides by Eaton's, to the north and to the west. 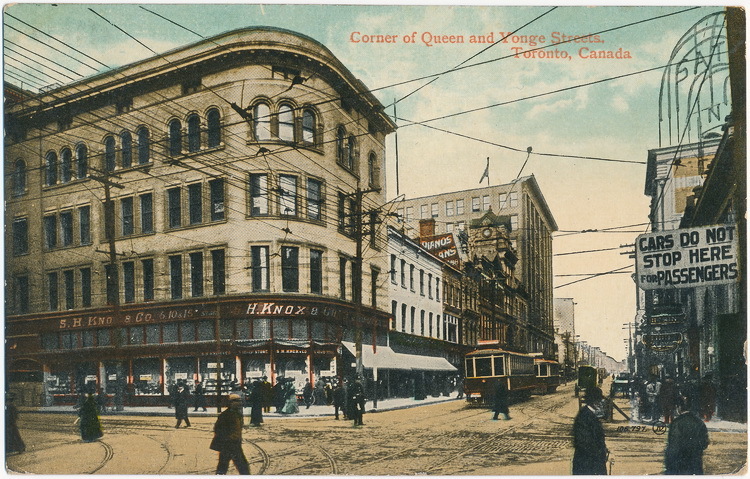 The addresses at the corner of Queen and Yonge Streets operated initially as two buildings, 180 and 182-184, and had several tenants, mostly dry goods and shoemakers, until they were amalgamated in 1910 under S. H. Knox & Co., toys, 180-184 Yonge, followed in 1913 by F.W. Woolworth Co. Ltd., smallwares, who remained at the location until 1978. 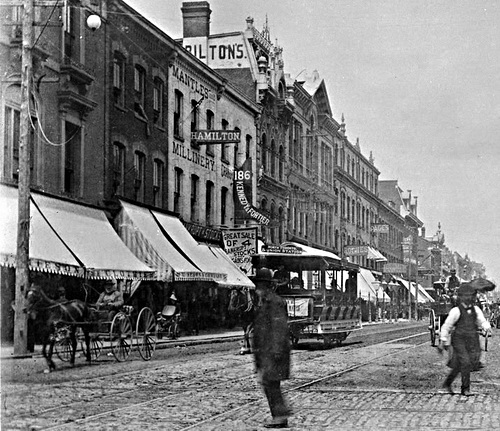 Bilton's immediate neighbour to the south at 186 Yonge Street also had a series of tenants: Toronto Tea Company (1872-73); W. Adamson & Co., importers and dealers in teas and coffees (1874-1881); J. J. Cook & Co., grocer (1882); Kennedy & Fortier, boots and shoes (1883-1885), which is visible in the 1883 photograph; Thos. Kennedy & Co., boots and shoes (1886-1892); Geo. McPherson, shoes (1893-1898); E. L. Kingsley & Co., shoes (1899-1901); and finally, the longest-term tenant to date, Gough Bros., clothing (1902-1910), which is visible in the 1907 photograph-postcard on the cover of this issue of Antique Phonograph News. There is no listing for 1911-1915. Then, in 1916, T. Eaton Co. is listed as owner and occupant. 188 Yonge Street was now surrounded on three sides by Eaton's. Recognizing the strength of the Eaton name, the Biltons and later, Gourlay, Winter & Leeming, never hesitated to remind the public of their proximity to the increasingly-famous store. Notice "1st DOOR SOUTH OF T. EATON & CO." on the 1891 GWL letterhead at the beginning of this article. However, at some point, with the inexorable expansion of the Eaton company, squeezing out the small businesses around them, there was a falling out between the Bilton family and Timothy Eaton. Family history describes a feud over access to a back laneway as the cause of the friction. When Naomi Bilton died in 1912, following her parents' wishes, she placed the narrow parcel of property at 188 Yonge Street in a trust, willed to the University of Toronto, on condition that it never be sold to an Eaton, that it never be leased for use as a department store, and even that the walls should never be cut or remodelled so as to permit such use! On April 23, 1923, after it was vacated by Gourlay, Winter & Leeming, the building at 188 Yonge Street was transferred by the Toronto General Trusts Company to the University of Toronto who leased the property to a succession of businesses for the next 50 years: Powell Kelley Ltd., shoes (1924-1927); Frederick W Lyonde & Sons, photographers (1925-1930); Rook's Millinery Ltd. (1928-1929); Lou Lucy Shops Ltd., ladies' wear (1930-1932); Jenny Lind Candy Shops (1932-1934); Evangeline Shops Ltd., ladies' wear (1933-1937); Morrow's Nut House (1935-1948); and finally, Reitman's Ontario Ltd., ladies' wear (1940-1975). In April, 1972, the University of Toronto was approached by a developer intent on acquiring 188 Yonge Street, the last hold-out building in the area, for the construction of the $250 million dollar Eaton Centre. The university was willing to sell but was bound by the conditions of the will. Finally, on October 18, 1973, the ancient feud was put to rest when the Governing Council of the University of Toronto approved the sale of the building, not to T. Eaton Co., but to the developer, Cadillac Fairview Corp., who promised that the property would not be used as a department store! City directories for 1976 and 1977 list the occupant at addresses 186-190 Yonge Street as T. Eaton Drug Co. Ltd. For a few years after that, the listing reads simply "discount apparel". Eventually, the building was razed to the ground and the land incorporated into the Toronto Eaton Centre which opened officially in 1977. With the re-telling of this story, William, Alice and Naomi Bilton may rest uneasy, but may they take comfort in knowing that their building was in the hands of an Eaton for only a few years, as T. Eaton Co. went bankrupt in 1999! 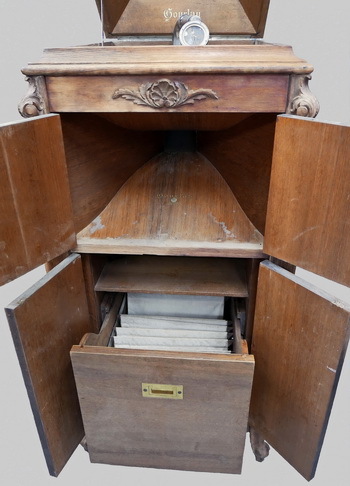 Many thanks to Doug McKen for photographs of his Gourlay phonograph, the only example I was able to find; to Paul Dodington for permission to publish the original receipt from his father's 1919 purchase of an Edison Diamond Disc Phonograph sold by Gourlay, Winter & Leeming; to Arthur Zimmerman for typically astute suggestions which overall improved the text of the article; and to Betty Minaker Pratt for her foresight and perseverance in accumulating a wonderful collection of ephemera documenting the early piano industry in Ontario.